Imagine if you woke up one morning and it had all rolled back. Your wife no longer had a job or even interest in having a job. She was at home patiently waiting for orders from you. Instead of having her own thoughts or plans or ideas, she lived only to serve and support you. All of which is to say that she was very, very dependent upon you. She did little or nothing without your explicit or at least tacit consent, down to the smallest activity. And imagine that your daughters, if they were not married already to men who ruled their lives, then now they are underpaid and disrespected nurses or elementary school teachers. You may have a daughter off at college but, by her own admission, she’s only there to get her “Mrs” degree. Your daughters, in fact all of your children, are as dependent upon you as your wife. They do little on their own without seeking first your approval. For every decision in the family, whether great or small, you must make it alone. You might talk to some other men about it or maybe look in the scriptures for some guidance—books written by men for men—but patriarchy demands that you make every decision and that every decision be flawless. This is the world where father must know what is best in every situation and all the time and for everyone involved. This is patriarchy, and it puts an impossible demand and weight on men while it robs women and other powerless people of participation and of a full voice in making decisions. What if this recent policy change and all of its devastating effects shows us why it will be a great day when there will be an end to patriarchy? It seems to me that the loving, wise, (white, heterosexual) men who seek inspiration to lead the church always do the best that they can. They have broad experience and a deep, abiding love of the Lord and of God’s children in and out of the church. It also seems to me that maybe they didn’t anticipate what might happen if they made this policy change in the way that they did. Maybe they just weren’t aware of how carefully we take even the smallest things that they do or say. It certainly would have been helpful to have heard this policy change from church leaders, especially if they could have explained more clearly how this blesses children as well is God’s children who are gay. Frankly, it feels to me like they have accidentally thrown out the babies with the baptismal water. I am ready and very willing to be persuaded about how all of this represents God’s continuing work of love among His children. I’m just not seeing it right now, and when I pray about it, fast about it, and study it out in my mind, I honestly feel that this policy is wrong. It just so happens that in the midst of all of this painful confusion, there have been two clear and powerful voices that have helped me stay faithful to my covenants, stay committed to the Lord and His church, and patiently wait for God’s will to continue to unfold. One of those voices is a faithful LDS sister, a mother and a professor and a woman who seems to be living up to so much of her wonderful potential. The other voice is that of a man who was a faithful missionary and who still has an abiding testimony of the gospel of Jesus Christ and of the Church of Jesus Christ of Latter-Day Saints while being a man who attends church regularly and is married to another man. These faithful, thoughtful, kind, and wise people have responded with all of those Christlike qualities to this policy change, a change that they find very difficult and painful. And because of patriarchy, these two people would not be part of the decision-making processes involved in this policy change. Patriarchy makes it so their voices, voices that are full of love and wisdom and faith, are not heard when decisions are made. Could it be that we as children of loving Heavenly Parents don’t receive as much inspiration as They would want us to have when we don’t involve women, minorities, and nonheterosexual children of God in those decisions? Could it be that our Heavenly Parents have more to tell us if we would listen to what They are telling us through more of Their children? 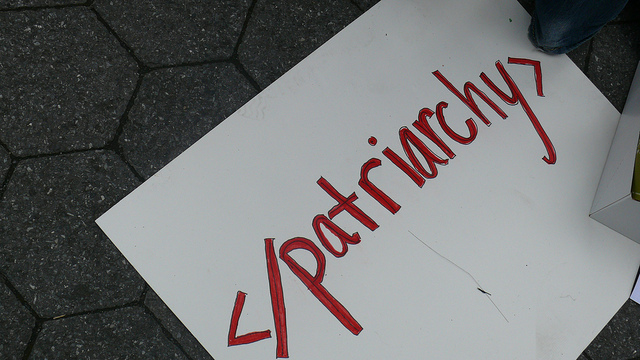 Could today bring us one day closer to that great day when we are no longer limited by patriarchy? Image credit: Charlotte Cooper (used with permission).